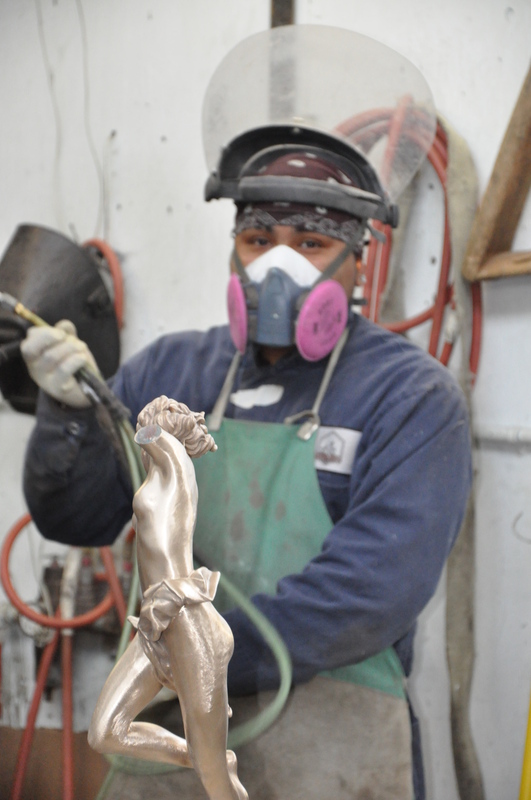 The casting process used at Artworks Foundry is the “Lost Wax”. The “Lost Wax” is the process by which a metal sculpture is cast from an artist’s original sculpture. This ancient method has being used since the third millenium B.C. and has withstood the centuries, visually telling the tale of past cultures, their religion and their social structures. The “Lost Wax” term derives from the wax replica that is melted out of the investment created, thus it is “lost” to receive the bronze. 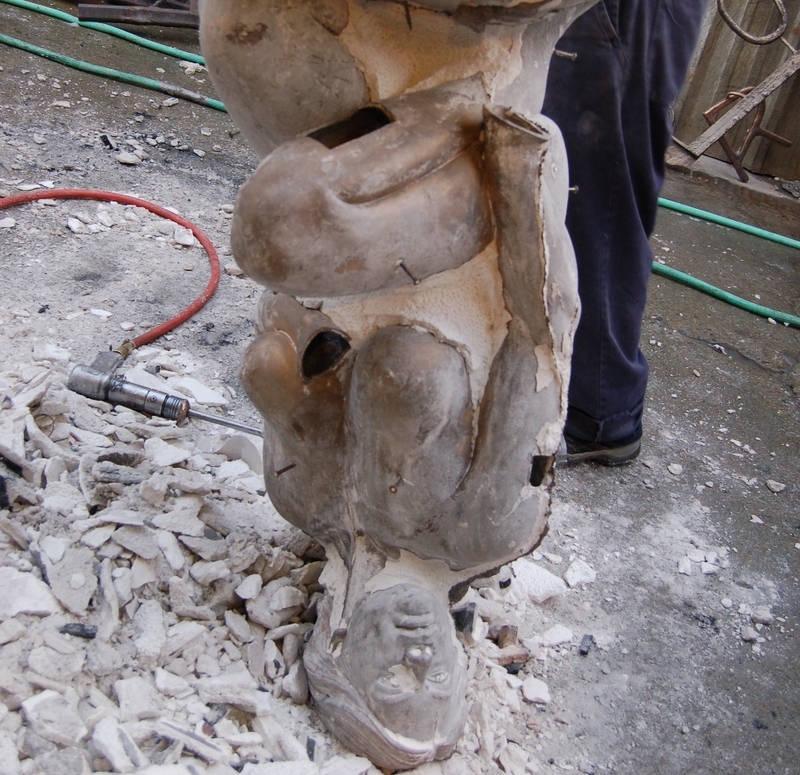 The metamorphosis of a sculpture from the original medium into bronze begins with a rubber mold. Half of the sculpture is nestled into a base of soft plasticine clay, the other exposed half is painted evenly with a clear, viscous rubber (Polyurethane). When the half painted with rubber dries, a protective and rock hard “mother mold” made of reinforced plaster is built around the pliable rubber. The sculpture is then turned over, and the process repeated. When the second side is complete, the mold is opened and the original removed from within. The rubber is rejoined with the other half, rendering an exact “negative” image of the sculpture in rubber. The original sculpture is now used exclusively as a reference point. 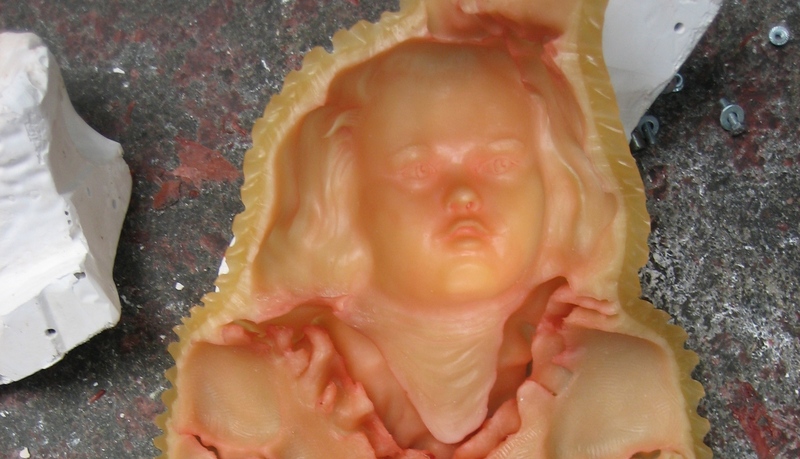 From the “negative” rubber mold, a wax “positive” is created. 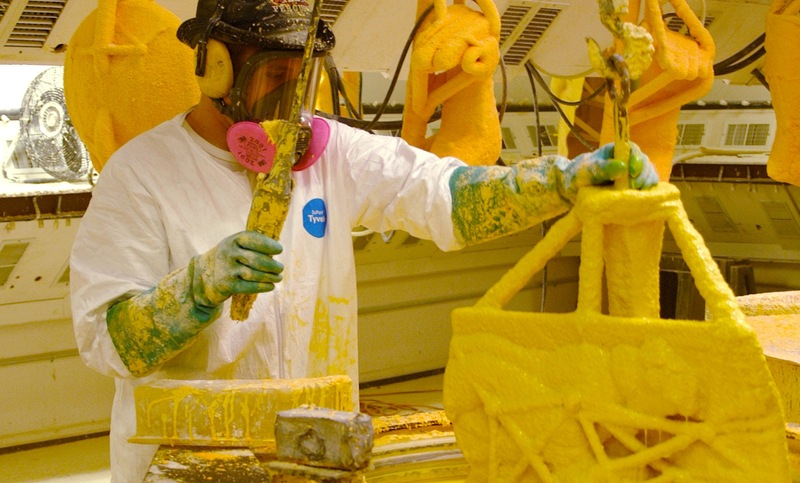 Wax is melted to about 210°F, poured into the mold and evenly coated or “slushed” inside. Slushing is repeated three times using cooler wax each time to avoid melting the previous coat. 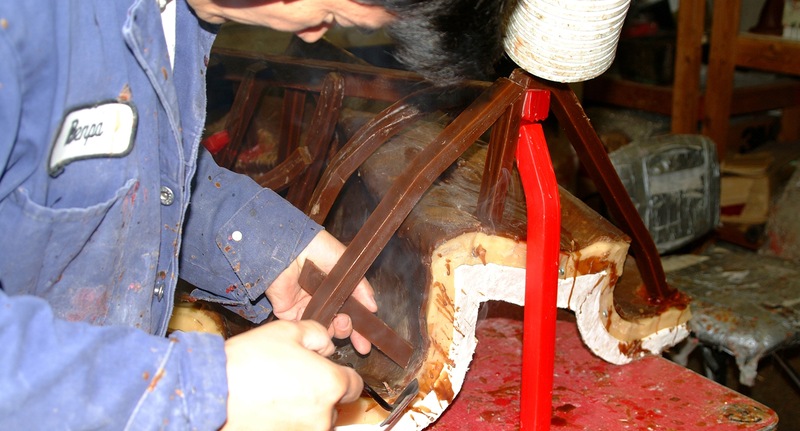 An exact wax thickness has to be poured, any less might create flow problems for the bronze; any more will result in a heavier than necessary sculpture. When the mold is opened and the rubber peeled away, an almost perfect wax reproduction is removed. “Wax chasing” is the delicate process of joining the wax pieces, removing seams and repairing imperfections with heated customized soldering irons or tools – dental tools are ideal. Artists are encouraged to visit the foundry at this point to sign and check the integrity of the wax. After the wax is chased and approved by the artist, the piece is then advanced to “Spruing” or “Gating.” The gates and sprues are also made of wax. They form the channels through which the melted bronze will travel to the artwork. “Vents” (thin wax sticks) and “Gates” (thicker wax sticks) are affixed to the wax reproduction with heated tools. Later in the casting process, the space occupied by sprues or gates become runways through which the metal flows and trapped gas escapes. “Investment” is the process of building a rock-hard shell around the wax sculpture. Later, when the wax has been melted out, the investment will serve as a mold for the molten bronze. The technology used for that is called ceramic shell and it begins by dipping the gated wax into vats of slurry followed immediately by a bath of sand. This process builds a very thin wall of silica around the wax. When repeated approximately 9 times, allowing for dry times in between dips, a hard shell about ½” thick forms around the wax. The wax inside the ceramic shell is a “positive” which must disappear in order to create a cavity or “negative” for the bronze to fill. Thus, the shells are “de-waxed” in a high pressure steam chamber known as an autoclave; plaster invested shells are de-waxed in a kiln. A huge graphite crucible, fired by a furnace, is filled with bronze ingots that are melted. The metal begins to melt at 1700°F. Bronze “seizes” (stops flowing) when confronted with cold, which might occur if molten bronze was poured into a room temperature shell; therefore at the same time the bronze is being blasted by a natural gas furnace, the ceramic shell is heated in a kiln to approximately 1100°F. 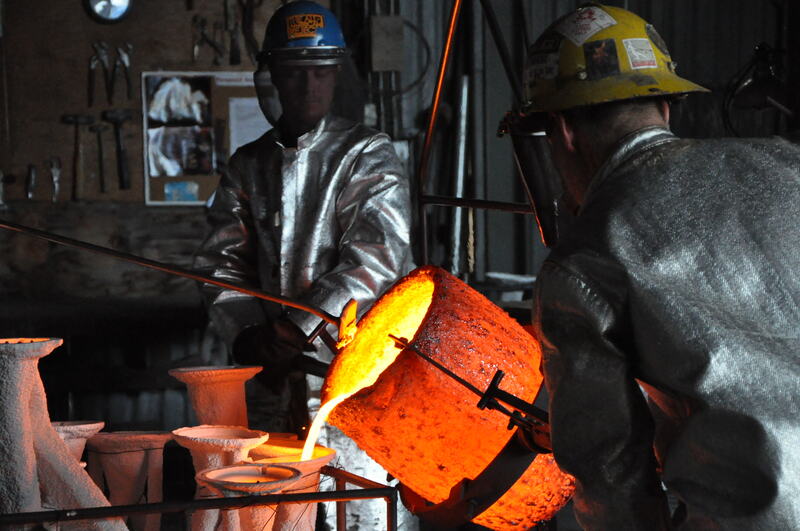 When the “Dance of the Pour” begins, the crucible is lifted by a crane out of the gas furnace. At the same time, the glowing ceramic shells are brought out of the kiln to the pour area. 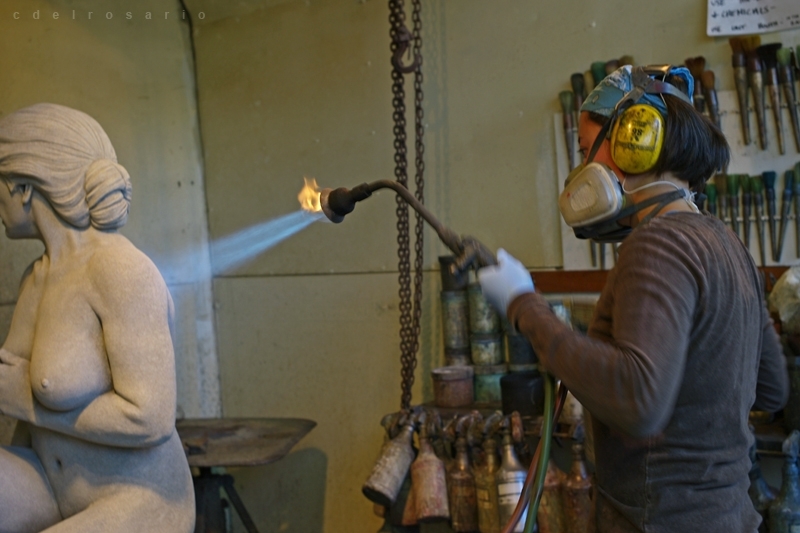 Two artisans operate the crane which holds the crucible in a “jacket.” The artisan with the controls is the “lead pour,” the artisan maintaining the crucible balance is known as the “deadman.” A third member of the pour team pushes away dross and slag on the surface of the molten bronze. The entire pour is very fast and very precise. Like wax chasing, bronze must also be chased or cleaned to address the slight imperfections that may result from the casting or shell building process. On larger sculptures, where assembly of cast sections is required, chasing is essential to take down weld line formed by the joining of two planes. Metal chasing usually starts with large electric or pneumatic grinders to remove the bulk of the unwanted metal. Then, more refined and smaller tools such as die and pencil grinders are used to re-create the artist’s subtle surface texture. Much as a house needs a wood frame to stand, many monumental bronzes require a stainless steel internal structure to support the bronze “skin.” Most larger than life-size bronzes are analyzed by a structural engineer who recommends a support structure that can withstand earthquakes and high winds. 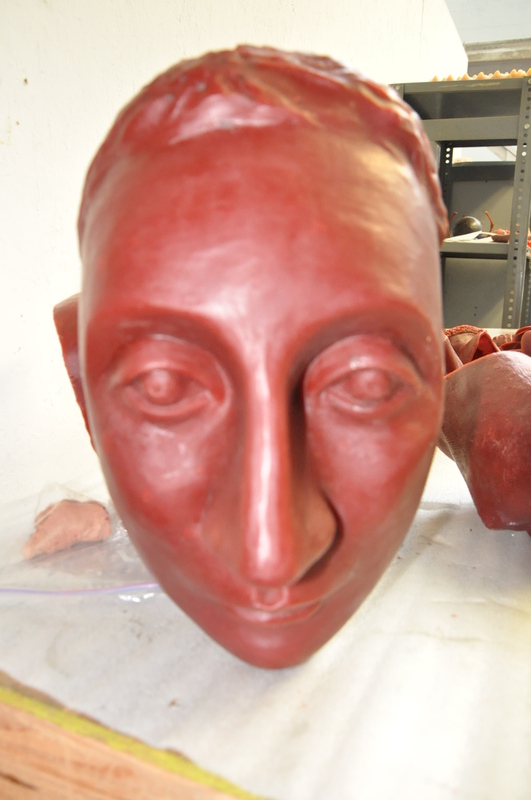 Patination is enhancement of bronze by the chemical application of color. Each foundry develops its own proprietary (and carefully guarded) patinas that result from a carefully orchestrated blend of different chemicals, pigments and application technique. A wide range of colors, both transparent and opaque are available to the experienced patineur. The final step is putting a thin coat of clear wax over the bronze to enhance and preserve the patina. At Artworks, we have successfully done our job if we translate your clay sculpture to bronze while preserving the integrity of the original. To help ensure this, we strongly encourage your participation throughout the entire process. We realize that quality cannot be delivered unless we are listening to the Artist before the mold is made and then again in wax, metal and patina stages. Artworks is committed to making your project as interactive as you desire. Good information! I like this article and the ideas.